There’s nothing wrong with being an introvert. I am the definition of a true introvert – I get exhausted spending too much time with people. That's never stopped me from using side hustles to increase my income, however. I've used side hustle income to pay off debt, boost my savings, fund vacations, and much more. When it comes to finding a sustainable side hustle, you need to be honest about what will work best with your personality and preferences. 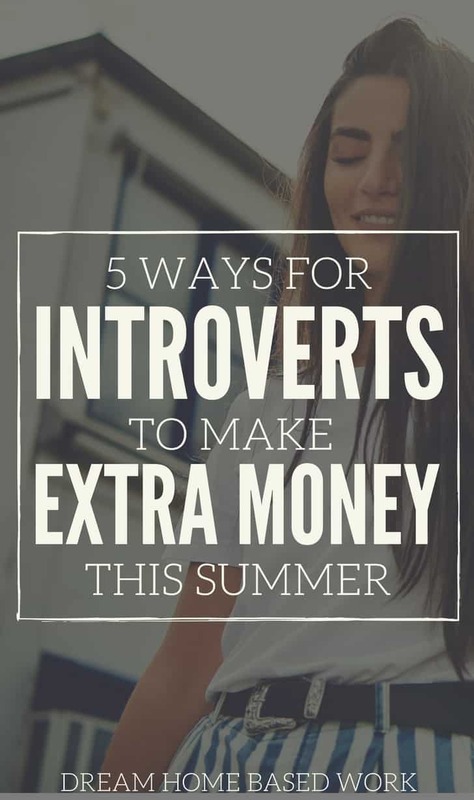 Thanks to the internet, there are plenty of ways to introverts to side hustle and boost their income without experiencing constant interaction overload. Here are 5 ideas to consider if you're looking to earn extra money this summer. Blogging is an excellent way to make extra money while working alone. The main part of blogging is writing, which can be done from the confines of your computer. Sharing your posts on social media can also be done from the quiet of your home. If you want to be part of an online community, you can do on your own terms with your own level of comfort. What you blog about depends purely on your interests. Do you like cooking? Crafting? Politics? It’s completely up to you. How do you make money from blogging? There are plenty of ways. You could leverage your blog for freelance writing opportunities like I do. You could earn money from affiliate sales. You could create your own digital products and sell them to your readers. Blogging has allowed me to fully explore the potential of making money online while thriving as an introvert. If you want to start your own profitable blog, here are 6 simple steps you need to take. Freelance writing is another way to make extra money while working alone. You simply get your assignments from the editor and then work on the article on your own time. Submit it, get paid, and repeat the process. Most editors will want to see some of your previous writing before hiring you. The best way to create some writing samples is to start a blog and post some of your own articles. Make sure they’re well-written so that you impress the people you want to hire you. You may be wondering why social media management is on this list of ways for introverts to make extra money while working alone. That’s because social media is anything but social! The majority of it revolves around you posting your own content. Take Twitter, for example. You can grow a large following on Twitter without interacting with other accounts. Just follow people who are interested in your content. Some will follow back. Unfollow those who don’t. Then repeat. When you manage someone else’s social media accounts, you’ll be responsible for posting the person’s content on a regular basis. There are tons of businesses and entrepreneurs who need people to help manage their social media pages. You may also be responsible for finding other content to post and occasionally “liking” and commenting on other posts. You can use online scheduling tools like Buffer or HootSuite to schedule out posts ahead of time and you can also track analytics for social stats. All of this can be done from your computer. You get the drill by now. Graphic design is yet another way to make extra money while working alone. Of course, you have to have talent in this area to do well. But you’d be surprised how much free information there is online to learn graphic design if you’re really interested. To start doing graphic design work, you'll need to know how to use programs like Photoshop and InDesign to create graphics. If you're interested in web design, learning some HTML coding wouldn't hurt either. With graphic design, the main interaction comes in finding clients and discussing revisions. You can set up a profile on a marketplace like Fiverr to aid in facilitating those interactions. Besides that, the designing is completely on you to do on your own time by yourself. 1. Decide on what you’re going to sell and make it. Are you good at money origami? Do you like to crochet amigurumi? Buy the products and tools you need to make your craft and then make a few different variations for people to choose from. 2. Choose a shop name. Make it catchy something that tells people what you sell and is also easy to remember. If you can create a play on words, even better! 3. Set up your shop. Make sure your product descriptions are keyword-rich. Make sure your photos look professional. 4. Make sales. You can wait for sales to roll in naturally from searches or you can advertise your listing. Make sure you ship your items on time if you’re selling physical products. As you can see, each step requires no interaction with anyone else. It’s perfectly possible to run an Etsy shop on your own. There’s nothing wrong with being an introvert. Although constant interaction with people can be challenging, introverts possess a unique set of talents and bring a lot to the table. One way to maximize your potential as an introvert is to find ways to thrive on your own. 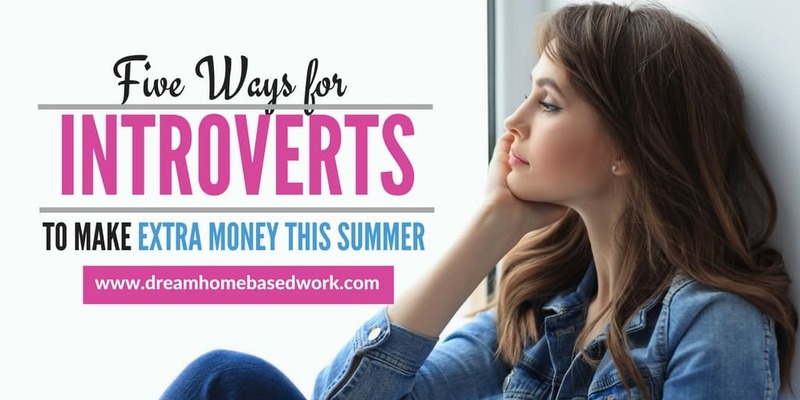 I hope you find one thing that you can use for yourself on this list of five ways for introverts to make extra money while working alone. Would you consider yourself an introvert? Will you be side hustling to earn extra money this summer? If so, what type of work are you considering?